The family room might be my favorite room in the house now. I was chatting with a friend last week about how long it can take to figure out how to make your house work for your particular family, the way you live. Not only how it looks, but how it functions. In six and half years, this is the first time this room has felt like us. It helps that we’ve moved beyond big baby and toddler toys, and we don’t need to baby proof anything. Finally getting the scale of the furniture right has made a huge difference. Our old sofa and loveseat–which we bought for the enormous basement family room in our last house–just overwhelmed this room. Our new chairs arrived and we (the grownups) each have a perfectly comfortable spot to relax, with a good view of the television and a light for reading. I wasn’t sure what to hang over the fireplace, but I dug out this old poster, and I really like the punch of yellow and the clean, graphic lines of the Matisse sketch. I’ve since hung it a little higher (I had to add some picture wire to the back) so the hardware doesn’t show. I assembled the two new bookcases and found space for all of the board games, the overflow of books, and some baskets of toys. 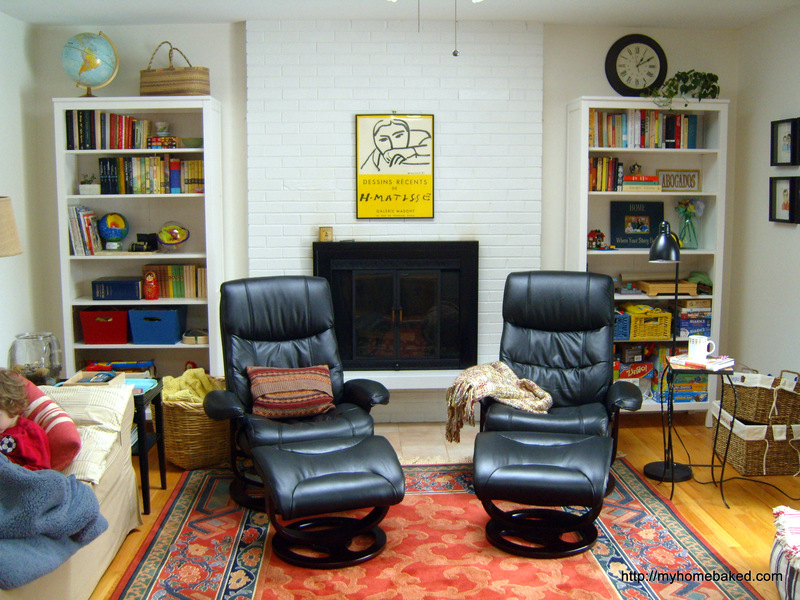 In the future, I might be more thoughtful about which books to keep in the family room and which in the living room, but for the moment I am just happy that there is space for all the books. And now that the games are on open shelves in plain sight, the kids have been playing them more often. (Miss Eight and I really love Set these days.) I also finally framed and hung the series of favorite director prints that I gave the Hub for Christmas 2012. We moved the big coffee table from the middle of the room to one end. Little Six’s art projects (and accompanying mess) tend to take over the table so that we weren’t getting any other use out of it anyway. Now the table (and the occasional paint spill) is off the carpet and there is floor space to spread out a game, practice headstands, or play the Wii. This arrangement with our big old tv isn’t permanent, but we streamlined things by putting it on a smaller stand and tucking it into the corner. Someday we’ll get a flat screen and figure out a good layout for this wall, but this television is still going strong. I tacked up the colorful woven wall hanging from Ecuador to relieve some of the blank white space. 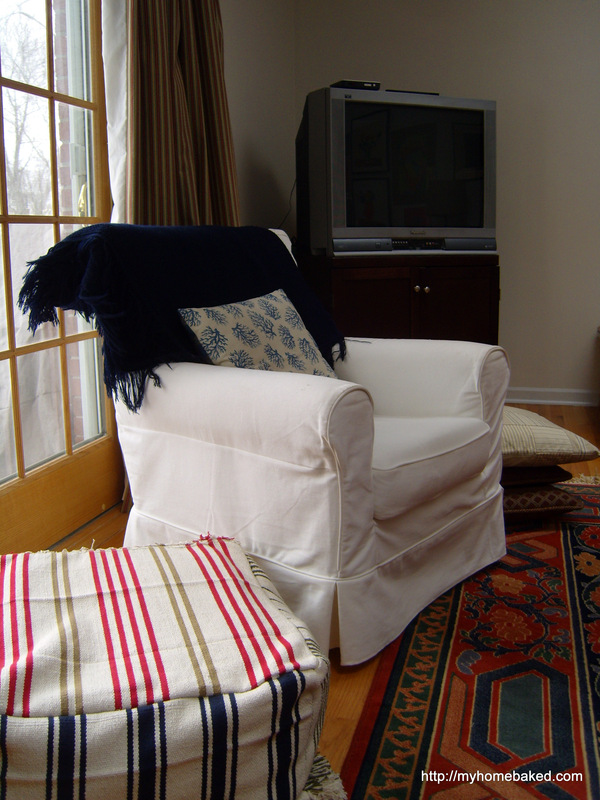 The little armchair adds just enough seating for the whole family to watch a movie together. It’s light enough to swing around and face the tv when we need it. 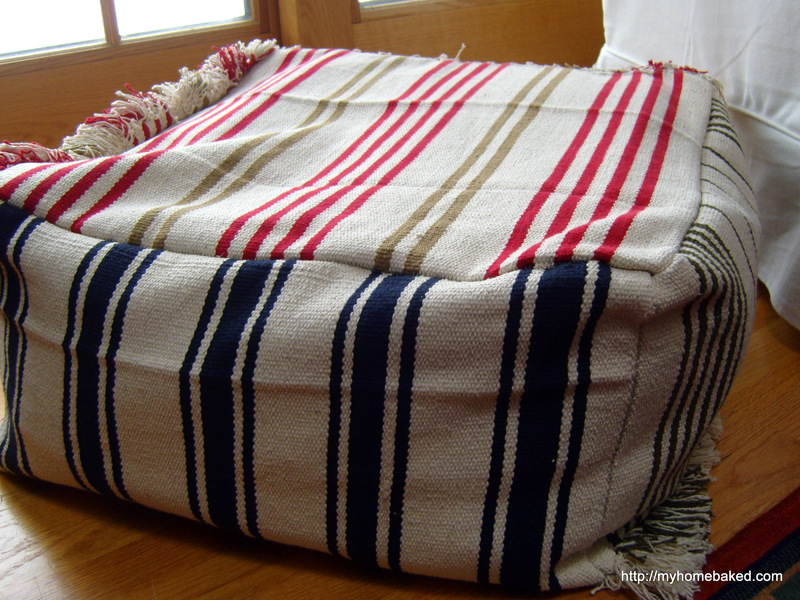 I also sewed up this floor pouf from three little cotton rugs to act as a footstool or extra seating. I loosely followed these directions (minus the zipper–I just hand stitched the opening). My pouf is stuffed with rags and a few pieces of foam. I might raid the rag bag and fill it just a little bit more. Hmmm…I probably should have ironed out the creases before sewing. We’re still on the hunt for a couple of new side tables so that every chair has a spot for a cup of tea and a lamp. In the meantime, I’m happy that there is finally space for the whole family in our family room. How have your rooms evolved? 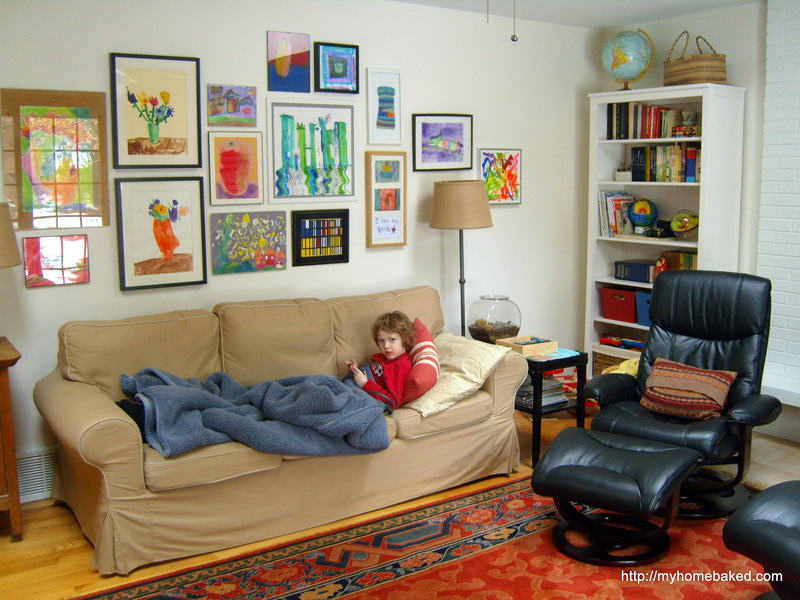 What changes have made the most difference in how you use and enjoy the space? I think figuring out function is the most important thing. 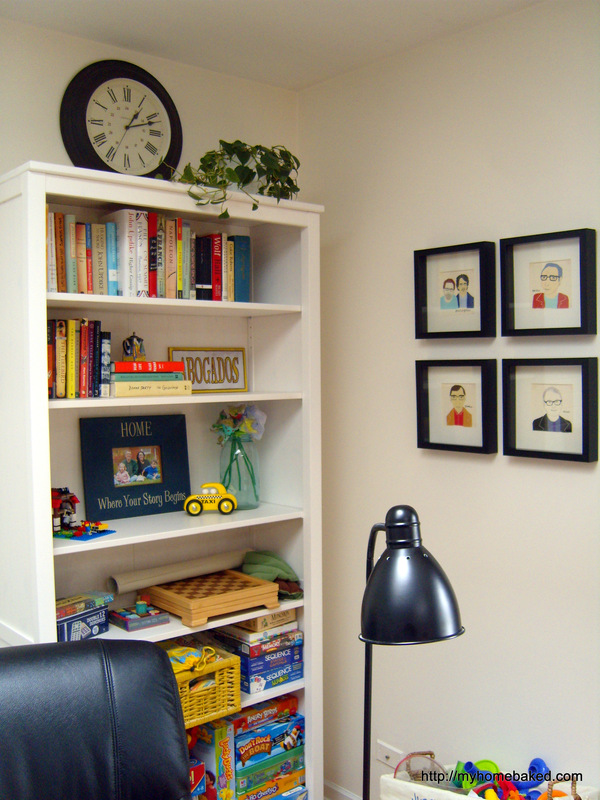 We couldn’t make any progress on our family room until we got really clear about how we wanted to use the space. Looks like you’ve done that! 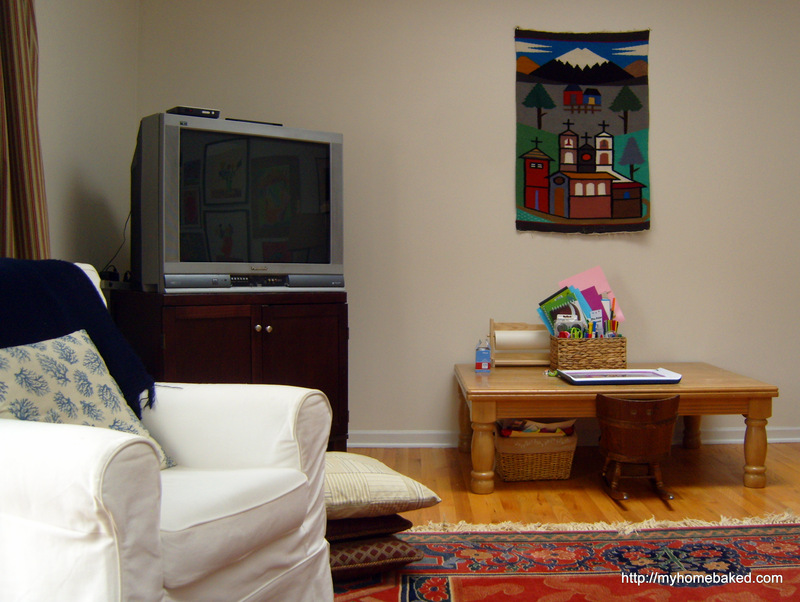 Your room looks cozy and real–just what I like most in a family room. And in a house with growing kids, the function evolves from year to year. It’s refreshing to rethink a room for how you can use it NOW.